Why Are Millions Choosing Chiropractic? Chiropractic care enables the body to do what it was created to do: heal itself naturally. With health care a priority in today’s society, it is sad to know that many people suffer from aches, pains, illness and serious diseases and don’t even know how chiropractic care can benefit them. It doesn’t matter what the health problem is; the bottom line is that every human being will do better with a healthy, functioning nervous system. Chiropractic care enables the body to do what it was created to do: heal itself naturally. By correcting spinal misalignments, chiropractors restore this natural power of the body. It is this principle – the body’s ability to heal itself when interferences are removed – that has kept chiropractic growing since its inception over 120 years ago. Chiropractic offers results when other methods fail because it addresses the problems of the body in a different way than other doctors. 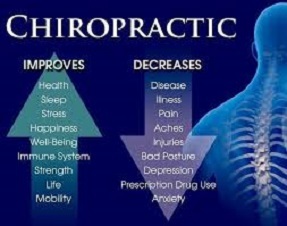 Anyone who suffers from any form of health problem really should explore the options chiropractic care offers. Suffering can be relieved through chiropractic; and that leads to healthier, happier living.